With New York City celebrating the Yankee's World Series Championship, the runners-up have already begun to address the mission to re-capture the trophy. The sting of tantalizingly just falling short of achieving the Phillies year long quest has not even begun to fade, but Ruben Amaro and his aids have already moved forward on setting their course of strategy for next year and beyond. Overall, the team is in great position to realize ongoing success, but organizational philosophy and some key decisions will certainly influence the course of events. Some have been surprised by Amaro's ability to step in and quickly make a big impact, displaying decisiveness and a well thought out plan. He has exhibited a bias towards action, but at the same time maintained an important balance. The mid-season decisions to decline meeting the Blue Jay's trade demands and then completing a better deal for Cliff Lee serve as perfect examples. Amaro's presence alone is an important factor in projecting a bright future for the team. Additionally, he has other solid baseball people around him and ownership that allows them to be the experts. Early indications are that the Amaro regime advocates maintaining an organization that fields a perennial contender, but within bounds, will make the moves necessary to win it all. In other words, they are both sound business tacticians and fans who long for a champion. A World Series ring and a couple National League Championship trophies over the past couple years make a compelling case that the Phillies are doing just fine on their own; however, I have a few thoughts that I would like to put into the franchise suggestion box. These fall far short of the total body of work necessary to run and sustain a highly successful major league baseball team, but surely will have import in 2010 and beyond. Cliff Lee is the type of pitching ace and personality that is ideal for this team. After displaying his capabilities throughout the post season, he clearly will not come cheap, but he is perfect for this team and worth the money. It is reasonable to assume that the team's talent, a taste of the post season, the personality of the players, the chemistry of the team and the Citizen's Bank Park environment all currently serve as a strong enticement for Lee to extend his commitment to the Phillies. The team has long shied away from inking pitchers to long-term deals, but if ever there was a situation that called for a variance, it is this one. Lee is in his prime at 31, has an intense competitive demeanor, provides a tremendous role model for other young pitchers (Hamels, Happ, Blanton, Drabek, etc), has been injury free, possesses a live arm with strong mechanics and simply knows how to pitch. Last year's 22-3 Cy Young season and this year's post season are a harbinger of what to expect over the next 4-5 seasons. Lee is the perfect anchor for the pitching staff for years to come. And, importantly, he adds to the marvelous team chemistry. Sign him to a long-term deal now while many factors are favorable and before the Evil Empire has a chance to overwhelm him with a financial package in a different stratosphere from the rest of baseball. Stick to your guns and don't mortgage the future. The mid-year decision to hold onto J.A. Happ and the team's top prospects by trading for Lee at a much more reasonable price will prove to be a terrific move. 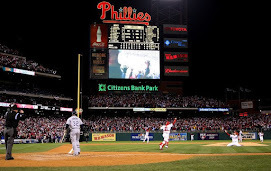 Public sentiment at the time leaned heavily towards giving up whatever was necessary to land Roy Halladay. This pot has been stirred up by a Philadelphia sports writer once again advocating this move. The Phillies surely have a great nucleus that could be intact for easily another 4-6 years, but resist the temptation to go all in without regard for the future. In the moment it seems good to fans who thirst for another taste of a championship, but those same fans would loathe a future team that is an "also ran." Many criticize the Eagles model for running a franchise that has maintained them as a consistent contender because they have been unable to secure the Lombardi Trophy. Perhaps they have failed to make a bold move or two to put them over the top, but your actions this year show that you are willing to strike a balance. Every Phillies fan and organizational member would agree that another World Series Championship next season would be awesome, but the after glow would fade quickly if it meant mortgaging the future of the team's ongoing competitiveness. Stick to your guns to maintain an exciting, contending team for years to come. 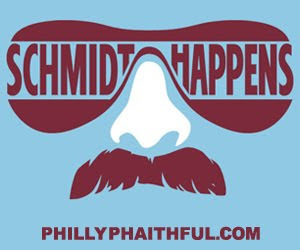 This era is too much fun and this team is too much a part of the Philadelphia cortex to relapse into a mediocre team. Lock up Shane Victorino and Jayson Werth with a multi-year deals. Shane Victorino is a catalyst on offense and a superb anchor in center field. He has led the team in hitting over the past two seasons, registering remarkably consistent numbers. He provides disruptive speed, gets on base and has surprising power. Besides possessing great range, his arm often limits opposing teams to station to station base running and stops rallies with outfield assists. His best years are ahead of him and he is a competitor with a personality that is a perfect fit for the team. Jayson Werth is a rare five tool player who is just now blossoming in his career. Over the past two seasons, his development continues to occur before our eyes, so there is every reason to believe he will only get better. Like Victorino, he is a gamer, covers a great deal of ground in the outfield and possesses an even stronger, more accurate arm. Werth also is smart on the base paths and has the speed to steal bases. And, very importantly, he provides prodigious power from the right side to provide some balance amongst the left-handed sluggers. Lastly, he shows plate discipline making pitchers throw and working walks, and with the visible adjustments that he has made, should continue to hit for a higher average. Signing these players now before the price goes up would ensure that they are fixtures for years to come and create a great deal of goodwill. Both possess an inner drive to play hard and contribute to the winning chemistry. Overspend to keep the nucleus of everyday players. Ryan Howard, Chase Utley, Jimmy Rollins, Werth, Victorino and, now, possibly Carlos Ruiz are worth spending to make them career Phillies. They are all in the 28-31 age range, and contrary to some opinion, there is every reason to believe that they will continue to be top players for at least another 5, 6 or 7 years. The competitive spirit that burns within each of them, along with the training regimen of modern players, will allow them to maintain their skills into their mid or late 30's. The Yankees return to glory this season was built around the core players that led them to success 10-13 years earlier, so folding in young talent around the Phillies core could also lead to an unprecedented run of prosperity. And, lets not lose sight of the fact that the Phillies great chemistry did not happen by accident, but rather because of these influential players. Build around your current pitching staff. Lee, Cole Hamels, Happ and Joe Blanton form a solid rotation that probably has its best work ahead of it. If the price is right and he would be committed to prepare himself for a long season, I would like to see the team bring Pedro Martinez back for next season. He appeared to be a positive influence and seemed to enjoy the players and setting, but most importantly, with greater endurance, he proved that he can still be very effective. He is Jamie Moyer, but with more movement and 6-8 mph greater velocity on his fastball. Hamels experienced what many others have after realizing a great deal of success at a young age. After being the toast of the town and the media darling following his shining 2008 post season performance, a ripple effect turned into a downward spiral from which he could not escape. A short off season was further disrupted by public appearances, media requests and other demands on his time. This disturbed recovery and preparation for 2009 after the most grueling season he had ever experienced, which led to diminished conditioning, reduced arm strength and physical breakdown. All of it took its psychic toll on a 25 year old player, bubbling up as shaken confidence and visible frustration. Although many were troubled by his comments during the World Series about needing to get a fresh start, that will go a long way towards getting him back on track. Absence the full context, the sound bite made it seem like Hamels was quitting in the middle of the series. That is unfortunate, but the bottom line is that decompressing and recharging after a frustrating season is the right medicine. The organization's belief in his return to prominence is well founded. The Phillies should make it a priority to re-sign Chan Ho Park, who pitched very well in a relief role. Although he was never mentioned as a possibility, Park possesses closer stuff with his 95 mph velocity, hard breaking curve and tailing fastball that allows him to jam righties and paint the outside corner. He throws strikes and gets strikeouts, and importantly, demonstrates poise under pressure. It was good to hear Charlie Manuel acknowledge that Brad Lidge needs to work in the offseason to improve his ability to hold runners. This was a major factor in his struggles this year as most every bloop hit, infield single or walk turned into a double or triple and a run waiting to happen. Lidge also needs to get healthy and a fresh start, and as he has proven in the past, he can rebound from an off year. Lidge's knee and elbow may also have contributed to "over throwing", which in turn, led to lack of command. Repeatable, fluid mechanics would also seem to be an area of concentration before next season's opener. Assuming Lidge can regain his previous form, a bullpen of Ryan Madson, JC Romero, Scott Eyre, Park and Lidge is a strong foundation. Of course, that may seem to be a big "if", so the team needs to have a back-up plan. I would have preferred to see Brett Myers back in 2010 as a contingency plan for a 5th starter, middle reliever or closer, but Amaro acted decisively and opted to sever the cord. Myers has a great competitive spirit and good stuff when healthy, but has yet to realize his projected potential, so a change of scenery can sometimes be best for both sides. If Martinez does not return, Park would seem to be a viable option as a fifth starter. He looked great in spring training in that role, but then hit a rough patch when the regular season began. If offering a starting spot is the only means to retain him, I would do it rather than lose him all together. It is hard to envision obtaining someone better without committing substantial dollars. If an impressive rookie named Happ was not waiting in the wings, Park probably would have gotten himself righted and been effective over the balance of 2009. Keep Feliz and sign a top middle infielder. The clock is ticking to make a decision on whether to pick up the option on Pedro Feliz or go another direction. Feliz played excellent defense, and although he lacked plate discipline and has not posted the expected power numbers, he drove in runs. Since he could come relatively cheap, rather than replace him, why not spend the money for a "super utility player" who could split time with him, but also spell Utley and Rollins more frequently? This would keep them fresher throughout the season and eliminate the huge drop off in offensive and defensive capability when they are out of the line-up. Free agents Marco Scutaro and Mark DeRosa come to mind as ideal additions who could get 400 AB playing a variety of positions along with third base. The Phillies have done a marvelous job getting the organization into its current position. Although the Yankees won this year's championship, I believe the Phillies have the best overall talent, especially when you consider future potential. The organization also has some future impact players in the farm system pipeline who can be folded into the major league team over the next few years. With the recent body of work along with continuing to preserve some organizational tenets, the Phillies are on the cusp of being recognized as role model for the rest of baseball. It has been a great run, and the potential is there for it to continue for the foreseeable future.